I think I’ve probably worked through about five incarnations of Geography A level, and pretty much the same with GCSEs. But what schools are going through now is unprecedented: wholesale turnover of GCSE and A levels in every subject, for different exams, graded and marked to different standards – oh, and all at a different pace and order. The presentation I took along to #pedagoohampshire recently was an attempt to consider this collision of currents. 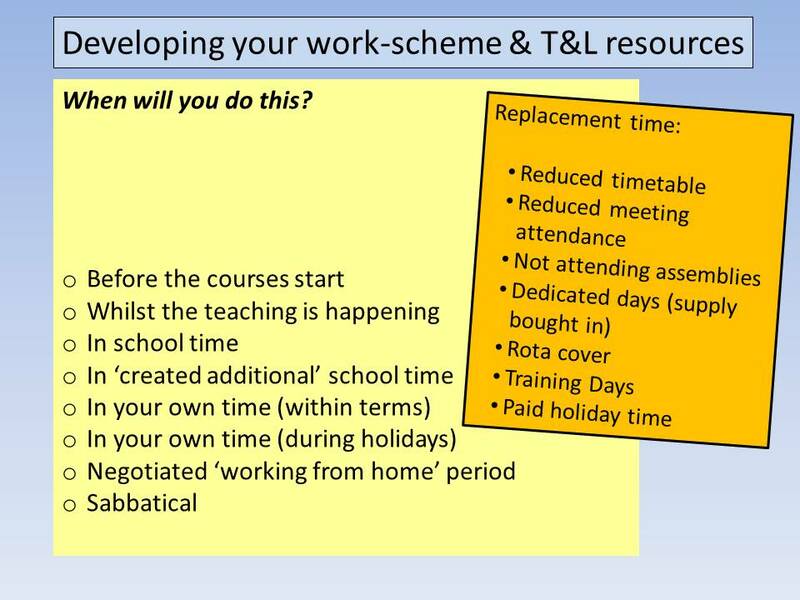 If we think ‘workload’ has been an issue of the recent past well, it’s just about to ratchet up three to eight notches for heads of department and subject teams as they are plunged into new courses, new schemes of work, new lesson plans and the production of new resources upon a swell of constraints. The next four years or so are not going to be pretty – that is, unless they have been planned and adjusted for, manoeuvred around and the positives grabbed as they float by, taken aboard and inflated into professional buoyancy that elevate school teams in otherwise turbulent times. Consider it, rather, a chance to review and refashion, release the creative and an opportunity to clarify base values and pedagogic convictions. It would be nice to imagine there is a logical roll-out of courses. There isn’t. The only one with a semblance of preferred introduction-route is Maths, with two years to introduce a new GCSE, followed by two years to then introduce their new A level (and this is only because the A level got deferred by a year). 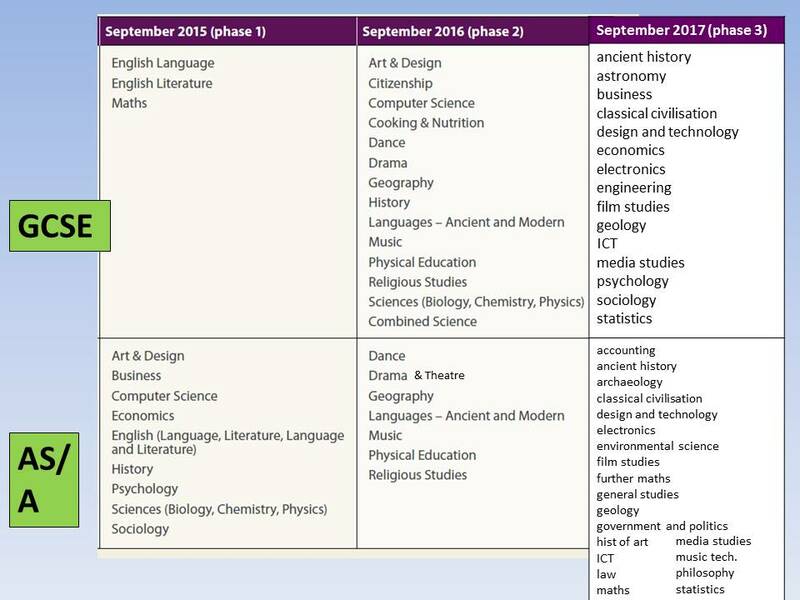 Some have the same time-frame, but the reverse flow – with business,economics, psychology and sociology preparing new A levels now, to be followed in two years time with new GCSEs. At least they can plan the KS4 course aware of the knowledge, skills and pitch of understanding students will need to progress further in their subjects. As for the rest – it’s overlapping course introduction. English is flung fully into the whirlpool with new GCSEs and A levels already embarked upon. 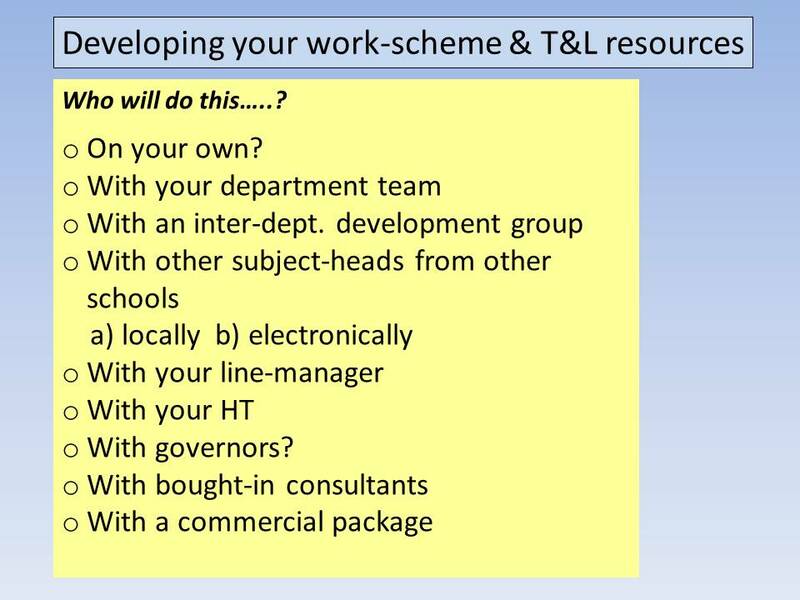 At least English departments tend to have reasonably large teams amongst which to delegate the workload. Not so for the Art & design, Geography and History departments – which are smaller teams, often with non-specialists and fewer to spin out the tasks to, with overlapping courses colliding into each other. One implication is financing the conversion. If your capitation allocation doesn’t take into account the different needs for new resources by different departments at different times – then why not? I say this as a geographer, but geog. departments should see the majority of their capitation (and other ‘no-change-this-year’ subjects) being divested to the English department, and to a lesser extent, Maths, who have the greatest need to resource-anew. The allocation should change as new courses come on stream. So check – does your capitation allocation formula recognise the need, by department, by key stage, and by year? Is there a planned disbursement of financial resources, or is it as it has always been done? There are schools that 3-line-whip the choice of exam board; for others it’s a free vote. The reasons for choosing a specific exam course will depend on your circumstances, the resources you can call upon (human as well as financial) and ultimately the one you think will best serve your students. Be prepared to justify your choice, be conscious of your motives, and recognise that it will probably be in place for at least five or six years – so that conditions that pertain currently may be different in four years’ time. It’s best to discuss, gauge opinion and base your decision on evidence rather than hunch. 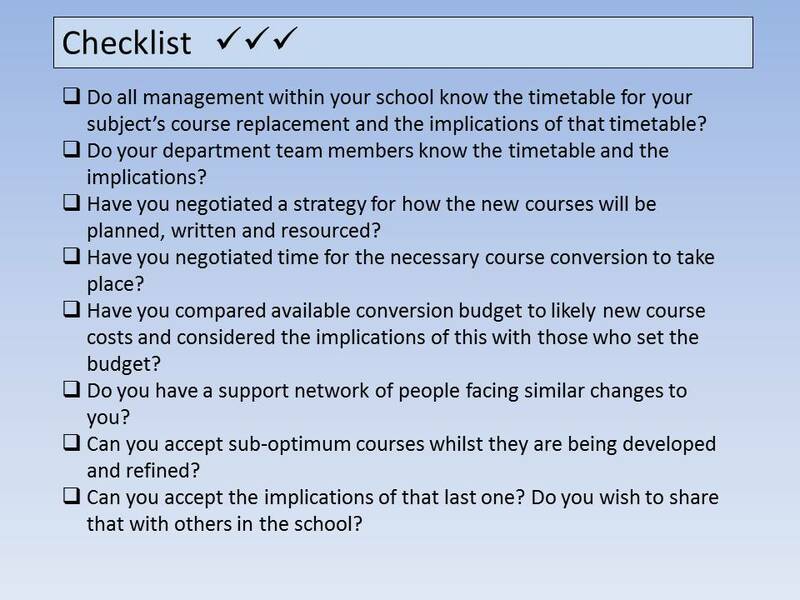 You will have to sell this course to colleagues, parents, governors – and certainly students. Most importantly – you have to sell it to yourself. 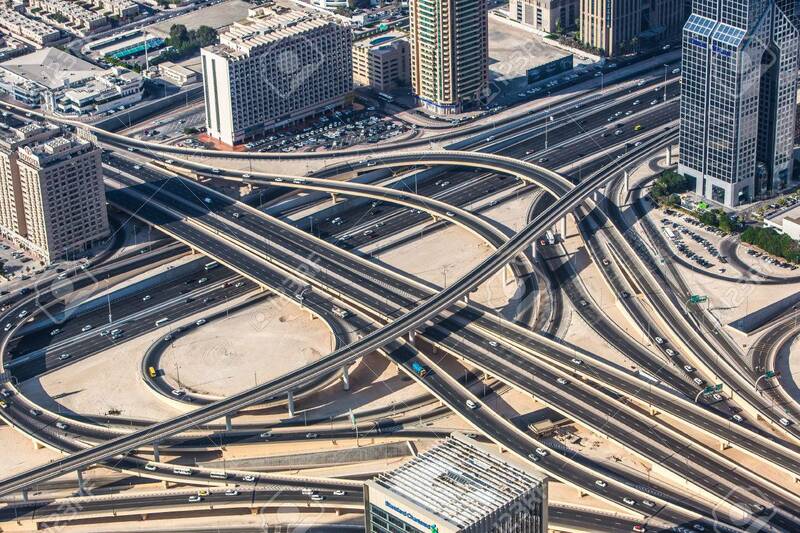 You can’t drive through the work that it will entail if you don’t believe, profoundly, that it’s the best one. 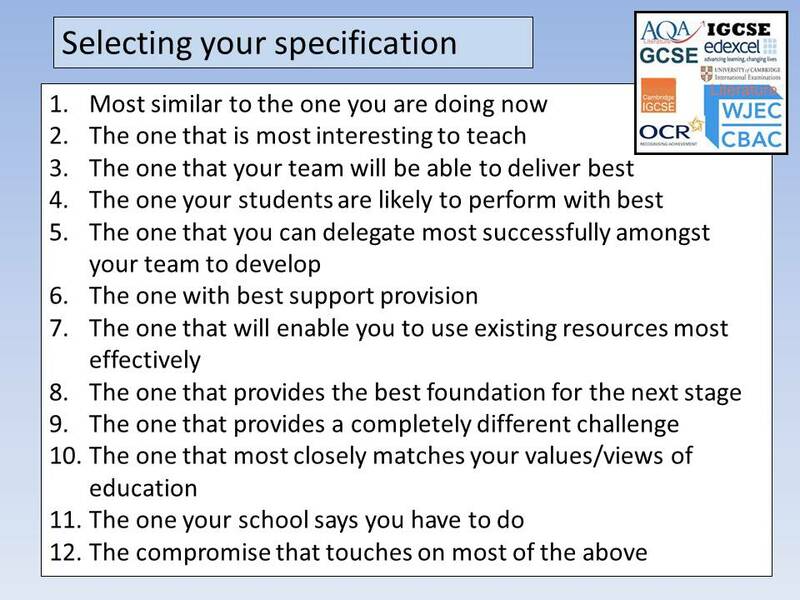 Who puts together the new course that will meet the needs of the chosen specification? Investigate the potential of others; there’s going to be a huge amount to do in a short time and time-resource is going to be the one that is in shortest supply. But beware of delegating to those who are already burdened, those who need direction rather than to direct and those who would see it as a chore to be dispensed with lightly and fleetingly. Having said that, you often open the richest channels of professional development when colleagues rise to the collective challenge, have input into what they are going to teach and are given room to develop their own thoughts on sequences of teaching and learning. As this is an experience that is going to be common to all heads of subject in the school, consider using them as an opportunity to share thoughts, experiences, problems and set collegiate standards of challenge for your students. Come together, pool, benefit from engaging with what is being proposed in areas beyond your own subject – then go off and make yours the best. This will be the crucial area for negotiation – how will be time be carved out to create the new schemes of teaching and learning, the lesson materials, the trial assessments, the marking standardisation….. ? – it goes on. Short of mass sabbaticals (which really aren’t going to happen – but they should), it will be the school that manages to think creatively, removes elements from the working week, contracts back to really core essentials, dispenses support flexibly and fluently – and invests in writing- and thinking-time for heads of subject and their colleagues putting new courses together – that manages the transition best. If this time is seen as an investment in the quality of student classroom experiences that will be directly feeding into exam results that will follow in 2, 3, 4 years – and beyond, then it will rise to the top of the list of priorities. You need to make sure it does. It’s not as if there are abundant provisions for this journey; the diet is likely to yield less nourishment. 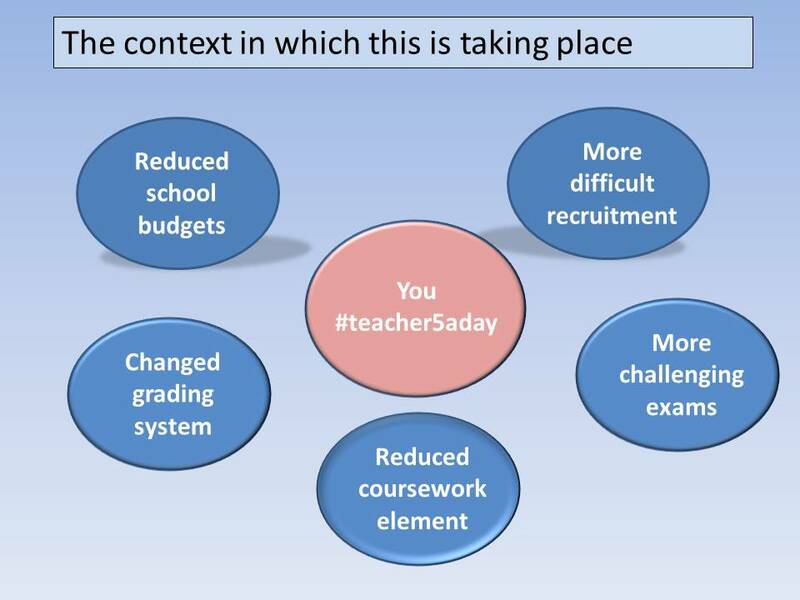 It’s important to face up to the constrained context schools find themselve operating within. Some of these are unquestionably challenging; others are changes that require conscious adjustment to meet – such as the reduced coursework element and greater emphasis on performing well in exams, for some subjects. St Francis of Assisi should be called on regularly here: “give me the patience to …. accept that which I cannot change…” (whilst putting on the pressure to change that which has an inch of give). If you’re reading this, it undoubtedly means you’re a social media user. The biggest change in educational communication has drawn in tens of thousands of teachers to twitter over the last few years. We’ve had out philosophies pulled and pushed, prodded and goaded, read about inspirational teaching, and magpie-d hints, tips and approaches that mean this is the most pedagogic-aware bunch of people who will be putting together a new exam course – ever. This is the opportunity to wipe the slate and chuck out dirty bathwater (holding onto proverbial babies). It’s the imperative that should see colleagues discussing the heart and purpose of their subject, and working off each other to devise the way that is communicated and lived in the classroom. My department universally declared the best day’s CPD was when we had the opportunity to book a conference room in an out-of-town hotel, spend the morning researching on-line subject material and researching the topic to inform ourselves, and the afternoon putting together a series of lessons for a new course we were teaching – with no interruptions, and good quality tea and coffee liberally on hand. Get out of the building, construct a course, build a team. Spark off each other. Plan out what you are doing within the context your subject area finds itself in. In a recent post ‘Taking the temperature of your department’ I wrote how teams go through periods of fluctuating fortune. Astute management will realise that not every department has equal capacity to face the changes that exam subjects will be going through, and should adapt their expectations to the ‘health’ each department is working from. And those will likely change over the next five years of course-change; some departments will strengthen, others will lose capacity – and being fine-tuned to what each department can perform at any one moment during that period will require senior managers who tread the ground, know the demands and can find supportive avenues to assist when it is necessary. Try to see this period, not so much as one of forced specification change imposed to an impossibly tight deadline, with yet more stringent exams – because that won’t be a frame of reference that allows you to come out of it better than you went in. Aim, instead, to grab the opportunities to meld a department team that has embarked on a common mission, if that is your fortune to lead. If you are a one-person subject lead, engage with others where and when you can. Assert your interpretation of good, sustainable teaching and start giving form to the best vision you have of purposeful, engaging and imaginative classrooms. And – yet – even in five years time, it will still be ‘a work in progress’. Be considerate to yourself and your colleagues and realise, you are unlikely to have the capacity to put all in place that you aspire to in the first few years – the conditions and the pace, the nature of the job, don’t permit that. Maybe the most important message is one of putting the best in place within the constraints you operate from, whilst keeping hours in the day for yourself, your family and your interests. Have too high a standard of expectation and you will burn yourself out. Allow others to demand the unreasonable – and the same result will arise. These are testing times; the test is to see it through whilst maintaining control of your inner space. The last thing that serves the interests of a generation of students, is a phalanx of burned-out teachers who attempted too much, too quickly and permitted a work-life balance to be extinguished. Make sure you’re still around, with spirit and enthusiasm, to refine what you started – in five years time. 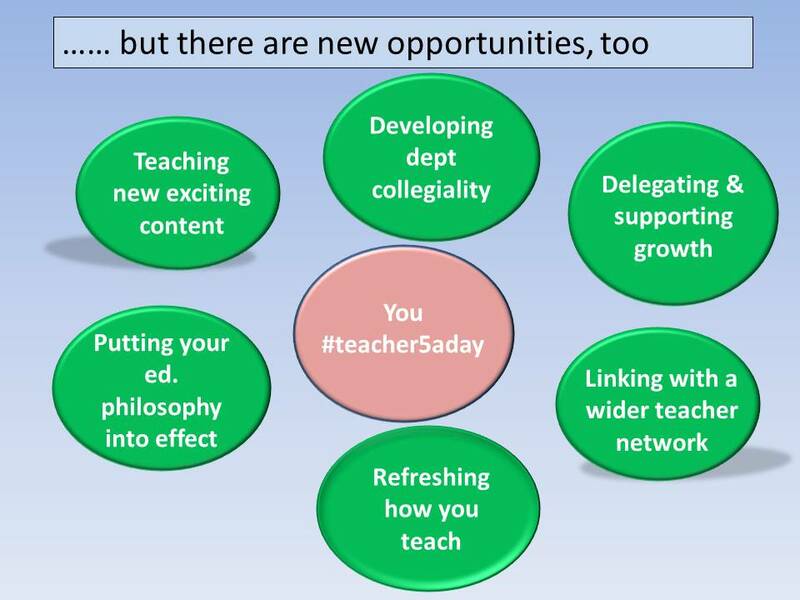 A vast professional body of sustainable quality would resoundly echo the aims of #teacher5aday.